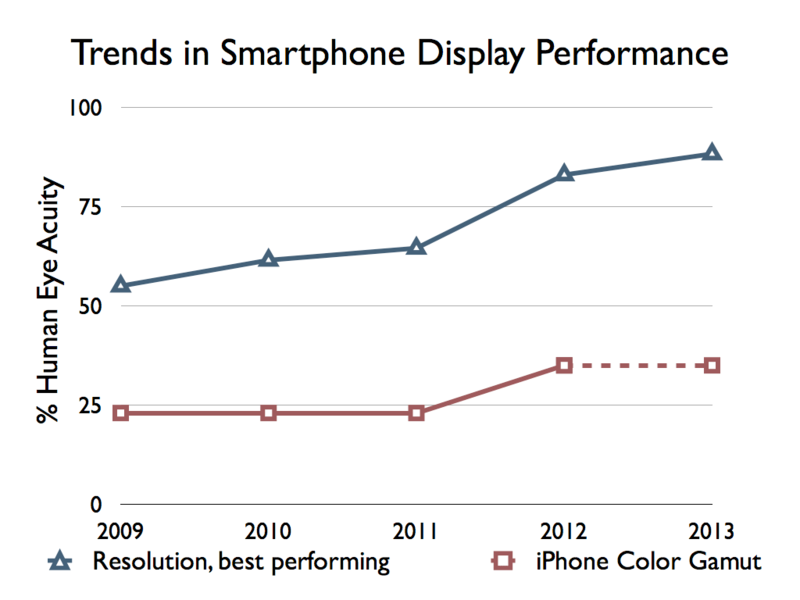 This entry was posted in Display Industry Trends and tagged Color gamut, display resolutions, display technology, iphone, retina resolution, smartphone, trends by Jeff Yurek. Bookmark the permalink. Tks for your post. But I really know how could you measure a smartphone gamut color? Or how can I decide how much color gamut of my smartphone. Thanks for the great links! I am happy i found your blog. Hope Wide Gamut will come to consumer products in the comming years.. Like 10bit over HDMI by default and so on. The ideal monitor would display every color that the human eye can see. In other words, every color in the CIE 1976 chart. Display R&D should not stop until we are able to view the ACES color space in its entirety. Since we presently don’t have the technology to do this, we should focus on increasing the color gamut to the maximum amount possible with the technology that is available.